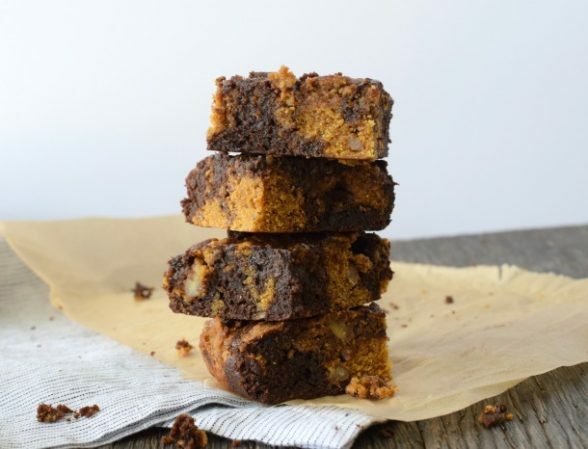 I wasn’t sure whether to post this delectable recipe for Halloween or Thanksgiving, because truth be told, I have made these bars for both holidays! I am really into desserts that can be made small like bars or cookies, as opposed to a pie which is kind of hard to cut into a small 3-bite piece. I try not to eat too much dessert, especially during the holiday season (which starts on Halloween, in my opinion.) Desserts are definitely treat foods to be eaten in moderation because they can really spike your blood sugar (even if you’re using a higher quality sweetener), pack on the pounds, and promote inflammation in the body. Moderation. The key here is to underbake them a little so they’re a little soft and fudgy. The inspiration for this recipe came from Melissa Clark, who I think is a great NY Times food writer. 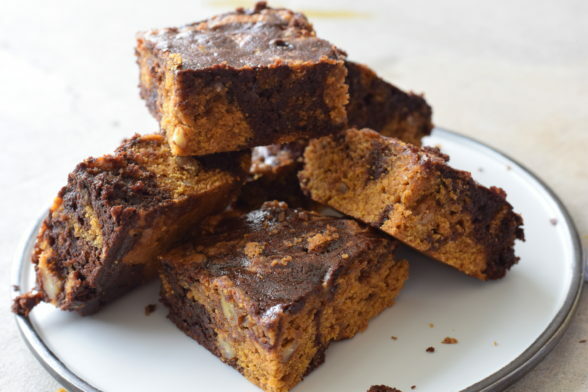 But her gooey pumpkin bars were so sweet, I actually found them to be inedible, sorry to say. I cleaned up the recipe to my comfort level — delicious, indulgent, but with much better ingredients and MUCH less sugar. As with most baked goods, these are best the day they are made. But they will hold up in an airtight container at room temperature overnight. These can easily be made gluten-free by using gluten-free oat flour. I am assuming you can swap coconut oil for butter without a problem. As for the egg, you can try a flax egg or aquafaba (chickpea liquid.) Let me know if you need more guidance with substitutitons. Stay tuned for lots of good stuff coming this week, including my first “get organized for Thanksgiving” post of the season on Thursday and the perfect quick and healthy dinner to make on Halloween before the kids go trick-or-treating! Prepare the pumpkin batter: Pour the melted butter into a medium mixing bowl. Whisk the pumpkin puree, egg, sugar, and bourbon into the butter. Whisk in baking powder, cinnamon, ginger, nutmeg, and salt. Stir in the flour and pecans. Set aside. Make the chocolate batter: Set a heatproof bowl over a pot of simmering water. 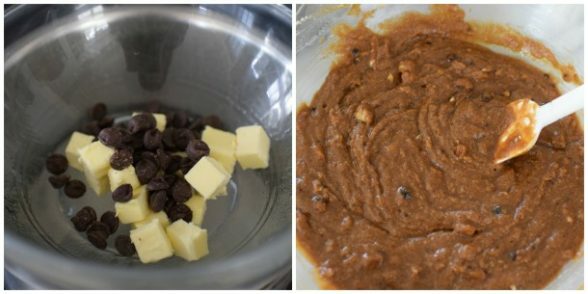 Melt the butter and chocolate together and stir well. Whisk in cocoa powder and sugar. Whisk in egg and then vanilla and salt. Gently fold in the flour. Dollop the pumpkin batter and chocolate batter in the prepared pan by alternating dollops. Start by placing a spoonful of pumpkin batter in each corner and in the center of the pan. Then add the remaining pumpkin batter in random empty spots. Fill in the pan with chocolate batter. Using a skewer or the tip of a knife, swirl the chocolate batter into the pumpkin batter. Bake for about 22-25 minutes or until just set. Do not overbake. Allow to cool completely on a wire rack before cutting. *If you double recipe, do not double egg in the pumpkin batter. Hi Pamela, these look delicious and I would like to make them. Where do you buy unsweetened pumpkin purée? It’s just canned pumpkin. You can get it at any market. Look for the plain pumpkin and not a product called pumpkin pie filling. Does that make sense? If I double this how long do I bake it for? Also, Can I prepare it the night before and bake it the day of? Thanks! You probably need to add an extra 5 minutes. I would not prepare it the night before and bake the day of. The baking powder will lose potency. You can mix all your dry ingredients together and leave them covered at rom temp and then you don’t have to do as much the day of. I made these, and they were absolutely delicious! Thank you for the recipe! These look amazing! Can applesauce replace the butter? Not a good idea? Thank you!! You can try, but the texture will be totally different. I have not tried it. If we are making our own oat flour, is it 1 c of oats to make 1 c. of oat flour or will I have to measure after I grind? These look great! Would coconut sugar work here? Yes, but the coconut sugar makes the pumpkin batter a little dark and kind of streaky. WOrks great in the chocolate batter, but I didn’t want to write the recipe with two different kinds of sugar — seems a little fussy.